First Day of the Summer Session: June 28th (Friday). Week 2: Face to Face: July 1st, and 2nd, and July 3rd. Online: July 5th. Week 4: Face to Face: July 15th to July 18 th. Online: July 19th. Week 5: Face to Face: July 22nd to 25th Online: July 26th . Specific dates will be announced by the end of the summer session. We will be enrolling 10-15 high school students who have no Chinese learning background, with preference given to rising juniors or seniors. Priority will be given to students who have limited background learning Mandarin Chinese, and can demonstrate a long-term commitment to learning Chinese with excellent academic standing. Participants will have to pay for daily personal meals, transportation to Hunter College, and field trips costs,during the summer program. Out-of-state students are responsible for arranging their own housing. We welcome rising seniors who apply to Macaulay Honors College at Hunter College or Hunter College and obtain admission to apply as incoming freshmen. 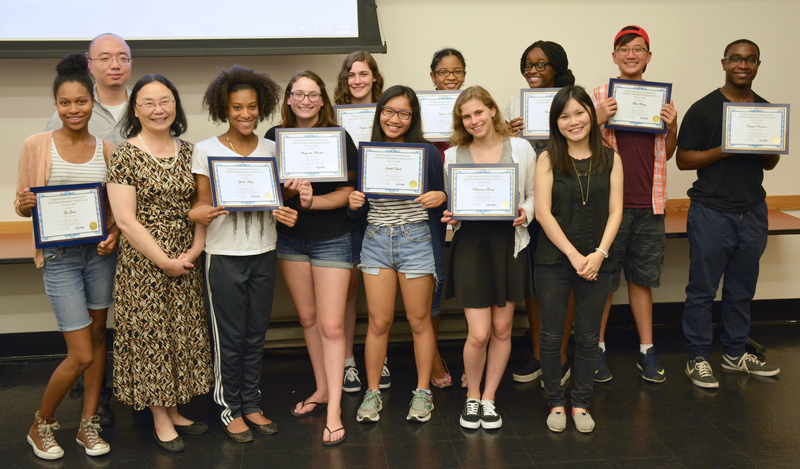 Incoming freshmen to Hunter College who have been accepted into STARTALK summer program will have priority to apply to Hunter College Chinese Flagship Center to continue their Chinese studies. The Chinese Flagship Center provides generous student support for study abroad, one-on-one instruction, and opportunities for internships in NYC and China. For more information about the Chinese Flagship Center, please visit: http://chineseflagship.hunter.cuny.edu/ or call: 212-396-6595. For more information about Hunter College, please visit http://www.hunter.cuny.edu/main/. Students will be instructed how to do self-assessment using the online tool Lingua Folio. Students™ learning portfolios will be used to evaluate their progress at the end of each session. Students will take STAMP proficiency tests during the first two days of the summer program and take post tests after completing the program. The pre- and post-test results will be used as partial criteria for eligibility for the post-summer program. Click here to learn more about the STAMP tests. A successful participant needs to demonstrate at least one-level of proficiency growth (i.e. from Level 1 to Level 2) in both speaking and reading of Chinese at the end of the summer and the post-summer programs respectively. All students completing the summer program successfully will receive a certificate. The curriculum features language immersion with a theme-based and task-based approach, and utilizes authentic materials in the target language. The theme is “My Mysterious Pen Pal.” The tasks will involve practicing communication, learning about culture, creating connections, making comparisons, and performing community service. In addition to language instruction, students will also be engaging in activities, such as calligraphy, painting, making dumplings, chess, view movies, cartoons, comics, as well as fieldtrip to various locations in New York City. Students should have a long-term plan for learning Chinese and a genuine interest in using Chinese in their intended professions. Students must have a record of outstanding academic performance and leadership. Fill out the program online application form. Obtain a copy of your academic transcript. Write a personal statement essay in English (500 words, single space, size 12, Times New Roman, 1” margin) talk about why you should be accepted. Send us your letter of recommendation, academic transcript, and personal statement by email or by mail. You may send in the application form and statement of purpose first if you need extra time to obtain your transcript and recommendation letter. Qualified candidates will be contacted for a 5-10 minute phone interview. Applications will be reviewed and accepted on a rolling basis until all the seats are filled.